The Pro-Fusion Precision Welding Lathe is designed to allow unskilled personnel to consistently produce high quality welds on a wide range of circumferential parts. With over 20 years of welding experience, Pro-Fusion can assist in weld schedule development and tooling in order to provide a complete, turn-key automatic welding system. Longer lathe beds available up to 72"
A complete Pro-Fusion welding system offers computer control of critical welding parameters including programmable peak and background welding current, arc pulsation, upslope, downslope, pre and post purge gas control. 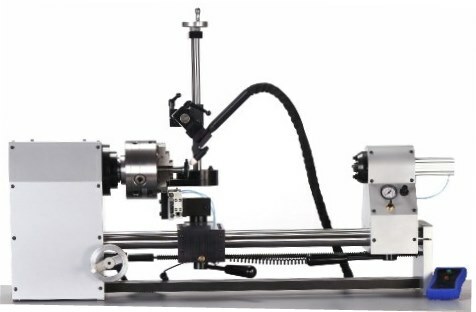 Pro-Fusion TIG/Micro-TIG and Plasma/Micro-Plasma welding power sources are available as a completely integrated package with a Pro-Fusion lathe. An optional touch-retract system allows for precise tungsten to work gap settings for additional torch positioning. 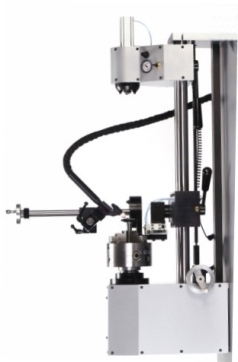 Specifically designed for welding and is not a modified or adapted machine lathe. Designed to enable horizontal or vertical configuration with no extra parts required. HEAD STOCK: Durable construction, DC servo motor, U.S. made roller spindle bearings, 6ï¿½, 3 jaw, true-set chuck featuring manually settable alignment adjustments. RPM range is 0.5 © 25.0 RPM. Custom RPM ranges available on demand. TAILSTOCK: moves on rails with ease for quick adjustment and manual lock. Live center features air actuated 3ï¿½ stroke with pressure / speed controls and independently adjustable alignment. TORCH FIXTURE: Pneumatic advance / retract for weld set up and part removal. Micro adjustments on X Y & Z axis. Torch may be positioned from 0 to 360ï¿½ on a rotating mount. Torch may be positioned for backhand and forehand welding positions. MOTOR CONTROL: Electrically isolated for protection against high frequency. To be used with tachometer equipped DC gear motors with maximum of 24V DC, 3 amps. Illuminated push button controls. Solid state design means no mechanical relays. Controls include remote, local, forward and reverse. Accuracy: Less than 1% of full scale error for settings between 10% and 100% full scale. Time delay fuse protected. The Pro-Fusion PFL 1216-3J comes complete with all controls, regulators, air filters and grounding brush.